The attractive pointed towers of the Puymartin Castle is one of the interesting sights of France. Because of its historical importance this medieval castle has been declared by the French Ministry of Culture as an important cultural and historical monument. Castle Puymartin’s attractive chateau situated in the south of France, Marquay, area Dordogne. 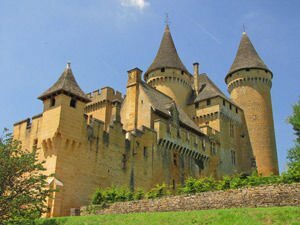 This medieval Palace is located between two villages Sarlat, a distant 8 km southeast and Les Eyzies, 11 km away. Puymartin Castle and its stone walls have already over 800 years of legendary history. The castle was built in 13 century and more specifically about 1270, when around it begins to form the village of the same name. Puymartin was located on the border between France and England and is one of the key strongholds during the 100-year war mostly because of its strategic location. A similar fate also have other names in the area. Situated on a steep hill with excellent views of the Valley, Puymartin continues to be the subject of battles between Englishmen and Frenchmen in the next centuries, during the so-called. Religious War (Wars of Religion). Around 1375 the castle fell into the hands of the British. A little later it returned to France in possession of the consuls of Sarlat, but then they abandoned it. Over the centuries Chateau de Puymartin repeatedly changed owners, and during the religious wars, is again the focus of disagreement between Catholics and Protestants from Sarlat. Around 1450 the castle was owned by Radulphe de Saint-Cla, which made significant improvements in its construction. Recent disputes over the ownership of Puymartin Castle finish in the 17 century, when Jean de Saint-Clar and his sister Suzanne spend more than 40 years of their life in quarrels which one is the legal owner of the palace. These violent family quarrels ended with victory by a female, and in the coming decades Puymartin is home to Susan. In 18 century, Puymartin was abandoned. Only in the 19 century Marquis de Carbonnier de Marzac bought the palace and begun a major campaign to restore its Neo-Gothic style. Chateau de Puymartin is composed of several large buildings that are interconnected with high pointed towers. Particularly interesting is the interior decoration of the castle. Inside can be seen authentically furnished rooms and halls with beautiful, colorful frescoes, tapestries , etc. Especially attractive is the winding staircase in Puymartin Castle, French style ceilings, beautiful wood fireplaces of 17 century and lavishly decorated paneling. The little room, painted with mythological scenes in 1670, impressed too, which are most likely works of the artist Philippe Lemaire.